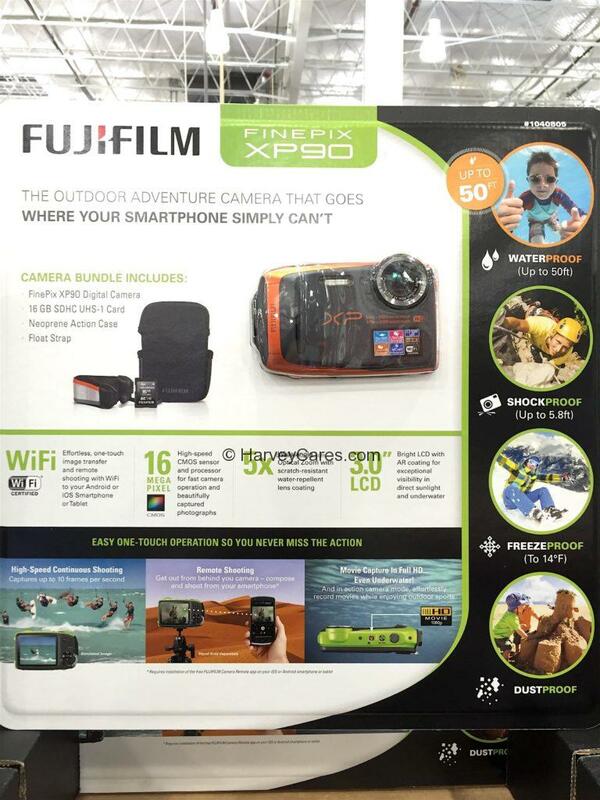 The Fujifilm Finepix XP90 Waterproof Camera is a versatile HD outdoor adventure camera that offers amazing connectivity. This is a waterproof, shockproof, freezeproof, and dustproof camera. The camera is essentially life proof. This camera simply goes to places that your smartphone cannot. You can film full 1080p HD videos under water. The Fujifilm waterproof camera can go up to 50 feet in depth. Take this solid camera to your next scubadiving trip. With its 16 megapixel camera, you can film high definition (HD) videos and pictures. The camera has built-in wireless connectivity. You can transfer images with one touch to your Android or iOS iPhone smartphone or tablet. Fujifilm also features PC AutoSave, where automatic backups can be done with your WiFi network. The WiFi connection allows you to remote shoot through your smartphone. Your smartphone would act as a remote to preview the image and capture what you want. This Fujifilm Finepix XP90 camera is covered with a 1-year limited warranty. The Fujifilm camera bundle also includes quite a few items that support your camera. Including a float strap, hand strap, neoprene case, a memory card, and other items. See the complete bundle list in the product review below. With so many features and functionalities, as well as comprehensive “lifeproof” features, it is a great camera to capture all of life’s actions. Looking to Purchase Fujifilm Finepix XP90 Waterproof Camera? Shopping for the Best Waterproof Cameras? The Fujifilm Finepix XP90 Waterproof Camera is wonderful. Back to the good stuff! Take a look at the detailed review of Fujifilm Finepix XP90 Waterproof Camera below. 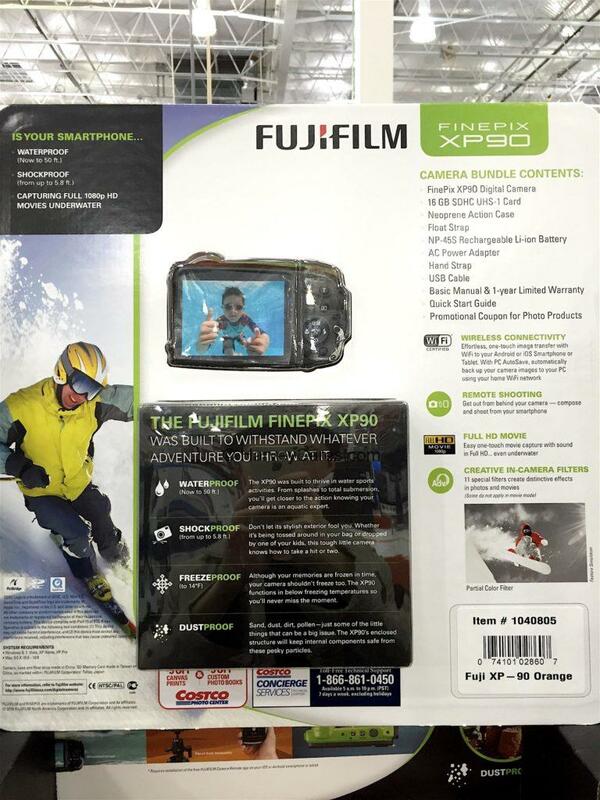 Item name: Fujifilm Finepix XP90 Waterproof Camera. Waterproof camera (up to 50 feet). Shockproof (up to 5.8 feet drop). Freezeproof (functions in below freezing temperatures to 14 degrees Fahrenheit). Dustproof (immune to sand, dust, dirt, pollen). 3.0″ bright LCD with AR coating. Built in picture filters for creative captures. The Fujifilm Finepix XP90 waterproof camera has many useful functionalities. 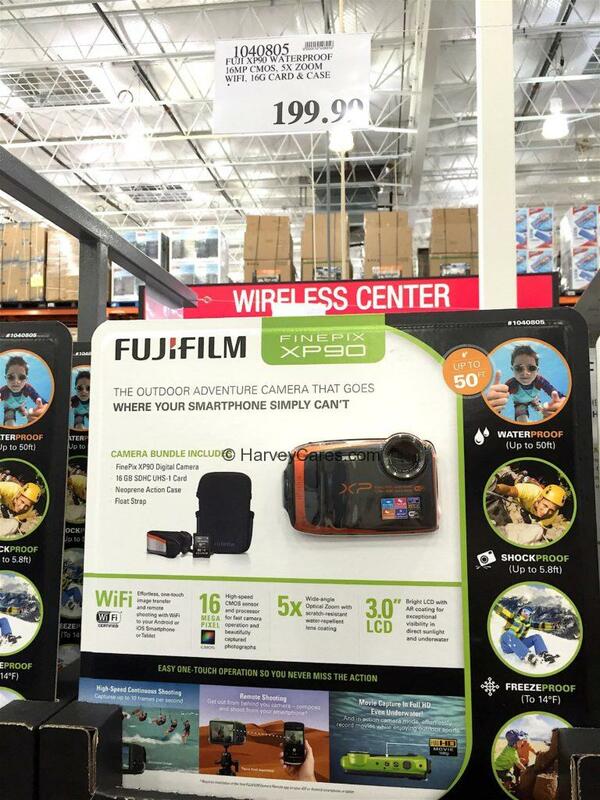 The Fujifilm camera’s built-in WiFi feature allows you to use your smartphone to control the camera. Start and end photos or movies. You can also take continuous photos at high definition. There are 11 special in-camera filters for creative and distinctive effects in photos and movies. Full 1080p HD video with sound at the touch of a button, even under water. Start capturing your dives and share what you witness under the sea. Record yourself swimming with fishes and other things you find in the water. A 1 year limited warranty covers this Fujifilm Finepix camera. 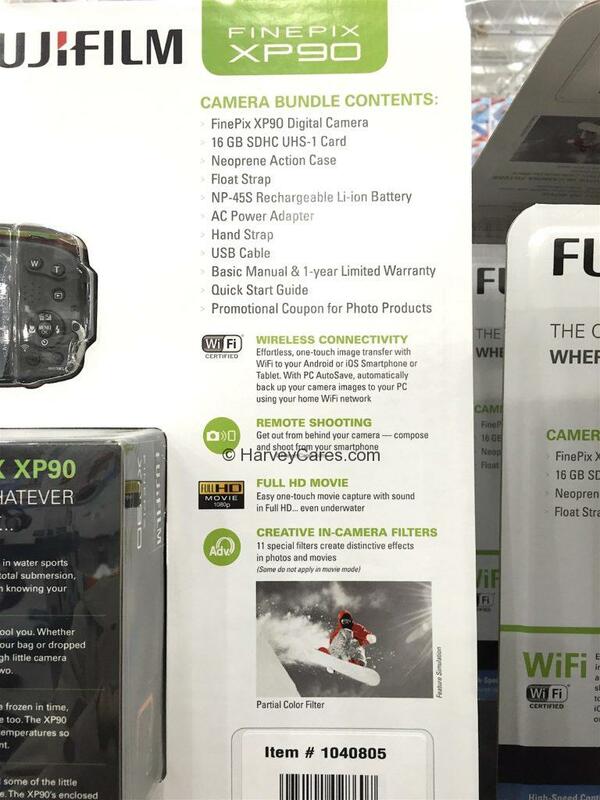 Fujifilm Finepix XP90 Waterproof Camera product back panel view below. 16 gigabyte SDHC UHS-1 card. NP-45S rechargeable lithium ion battery. Basic manual and 1-year limited warranty. Promotional coupon for Fujifilm photo products. 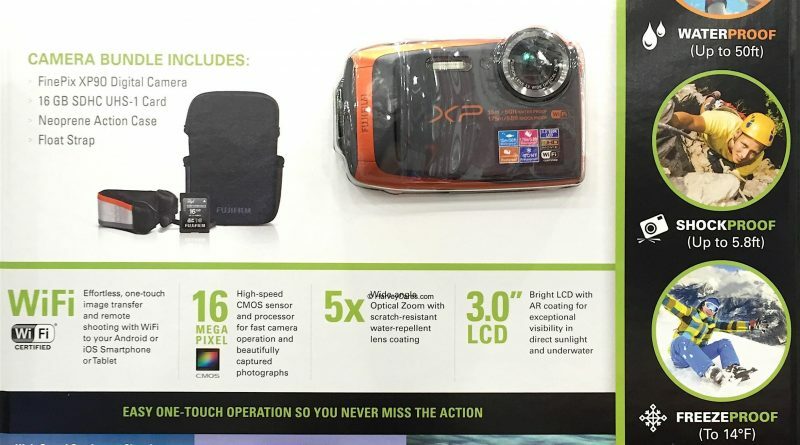 This Fujifilm Finepix XP90 camera can function underwater and capture full 1080p HD videos. It is also shockproof in case you drop it or bump it into something else while in action. You can also expand the internal memory of this camera by getting a memory card with higher capacity. This Fujifilm camera bundle comes with a 16 gb SDHC UHS-1 card. I have not seen this camera on sale before. 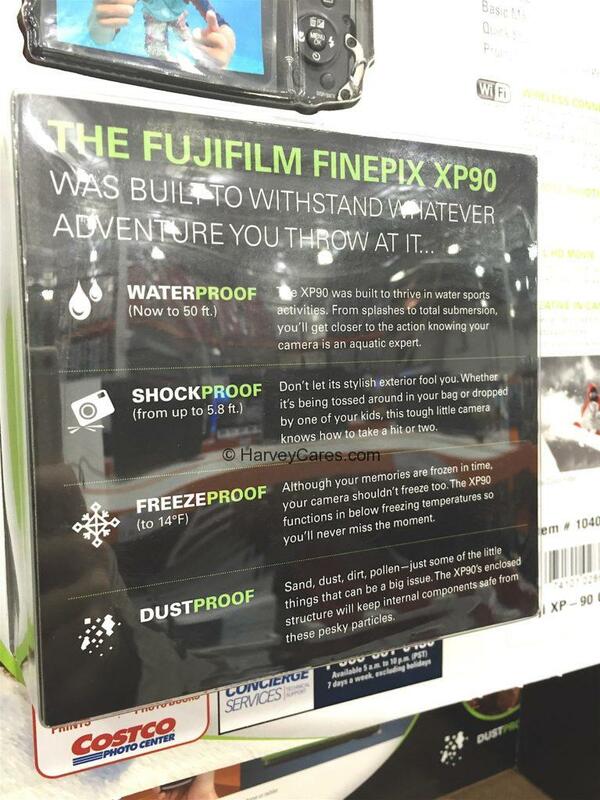 Have you bought the Fujifilm Finepix XP90 Waterproof Camera before?